The Menu at Pontlands Park offers something for everyone, whether you are staying at the hotel, just want to drop in for a coffee or to enjoy lunch, afternoon tea or dinner. 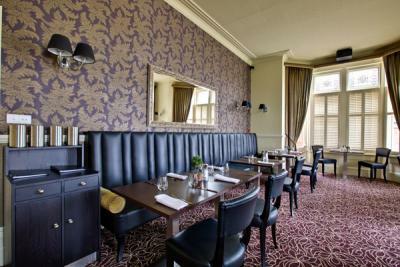 The Restaurant and Lounge are decorated in a relaxed contemporary style that fits well within the traditional building. Comfortable chairs, plenty of natural daylight, free WI-FI and our friendly staff make it the perfect place for a get together with friends and family or to escape the office and get some work done while enjoying a coffee. The Menu offers a selection of freshly prepared, seasonal dishes and where possible local ingredients are used. The little ones haven’t been forgotten, as we have with a kid’s menu offering more than the usual nuggets and chips. Our very popular afternoon tea is available 7 days a week, all of the cakes and sweet treats are made in house and the scones are served with the world-famous Tiptree jam and on a Sunday we offer a fabulous, family friendly carvery lunch. As well as a great menu we also offer a carefully chosen wine list, which includes many varieties available by the glass. Reservations are recommended, especially at the weekends, although not essential. The flexibility of the space available at Pontlands Park means whether you are looking for dinner for two, a relaxing meal with the family or to celebrate a special occasion, we can help. If you are looking to enjoy a celebration in private, it is possible to book one of our dining rooms for 16 -32 guests. We can offer a fixed price menu or create something to suit you and your guests. Please download our Private Dining Menu. To make a booking or for further information, please speak to a member of our team on 01245 476444 or email sales@pontlandsparkhotel.co.uk.